Being the reckoned names in the industry, we offer wide range of Acrylic Bath Tubs Round that are aesthetically designed and have smooth finishing. We offer the entire product range in standard sizes and add elegant look to the environment. These products are durable in nature and are sturdy in construction. 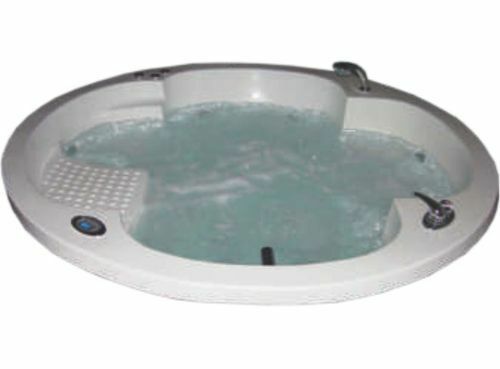 Acrylic Bath Tubs Round are delivered in standard sizes of 5' Dia or 6' Dia. The Price quoted is for Bathtub 6' Dia with Front Panel. These Bath tubs can be supplied with or without Front Panel. Whirlpool System, Air Bubble Massage, Hot & Cold Mixer with Spout & Hand Shower, Bath Pillow, Underwater LED Light. Packaging Details Wooden Crate (Optional) on extra cost. Based in Chandigarh, we are one of the leading manufacturer and supplier of Fibre Reinforced Plastic Products. Our range includes Plastic Sheets, PVC Plastic Sheets, Polycarbonate Plastic Sheets, Fibre glass sheets, FRP Domes, Acrylic Bathtubs, Plastic Flushing Cistern. Apart from these, we also deal in Mirror frames, Polycarbonate PVC and other plastic sheets. The company endeavors to meet customer’s requirements in terms of quality,price and dispatch schedules. Over the years, these products have found wide acceptance in India. The raw material used for the manufacture of these products includes fibre glass, plastic and wood. These products can be used in various industries such as domestic, agricultural, chemical, transportation and many more. Our efficient team of professionals also helps us in gaining our ever-increasing foothold in the entire business scenario. We are looking for the queries from Chandigarh, Mohali, Himachal, Baddi , J&K, Haryana , Delhi.